For the next two years I will be taking a break from teaching tutorials in first year undergraduate macro. That will be a relief for just one reason. I have become more and more embarrassed at having to teach the IS-LM model. The IS curve is fine, but the LM curve is not. The reason is obvious enough: central banks do not operate a fixed money supply policy. It would be nice to tell students that the fiction that the monetary authorities fix money is a harmless fairy story, but I do not believe this. Here are just three mistakes or confusions caused by using the LM curve. 1) Is that real or nominal rates on the vertical axis? It does not matter if expected inflation is constant, but we use the apparatus to look at price changes. 2) IS-LM leads to AS/AD. If your goal is controlling inflation, the AS curve suggests that all you need to do is to return to somewhere on the vertical AS curve. If you use a traditional Phillips curve with backward looking expectations then returning to the natural rate will not be enough. Which is the student supposed to believe? 3) IS-LM leads to textbook Mundell Fleming, which in its simplest form has domestic interest rates stuck at world levels. Everyone then learns that fiscal policy is ineffective under floating rates, which is unfortunate, because this is a special consequence of assuming fixed money. The IS curve plus UIP is a much better way to think about this, and gives a more relevant answer: a temporary demand shift is not crowded out by an appreciating real exchange rate if domestic interest rates are unchanged. I’m currently lecturing on Oxford’s second year undergraduate macro course. There I largely ignore the LM curve, and (following the textbook by Carlin & Soskice) instead teach a three equation model involving an IS curve, a Phillips curve, and a monetary rule. The monetary rule captures the idea that the monetary authority has preferences over excess inflation and the output gap, and combining this with the IS curve and Phillips curve we can derive a Taylor rule. While the monetary rule curve is far from ideal, representing the result of a static rather than dynamic optimisation exercise, it at least captures the spirit of what central banks try and do today. This sequencing seems clearly preferable, so I find it puzzling that most Principles textbooks do not take this approach, but instead continue to start with IS-LM. Why are they so devoted to the LM curve? Is learning about the LM curve meant to impart some deep wisdom to students? Is there a feeling that because money is important in understanding how business cycles and inflation work, it should be introduced as part of the core model come what may? This seems strange, and is probably counterproductive. Perhaps the explanation is more mundane: that the economics of high volume textbook publishing is such that innovation is difficult to do. I sometimes say to master’s students just starting the core macro course that they will spend some time learning about the same stuff as they did when they were undergraduates: inflation, unemployment, business cycles. The key difference is that what they learn will only be 5 or 10 years out of date, compared to material that is 30 years out of date for undergraduates. Strange, but unfortunately true. Government debt in Europe: some good and bad news. The good news is that in amongst the various directives/regulations/treaties that have recently been agreed by the European Union, there are clauses that encourage the formation of fiscal councils, together with the need for independent fiscal forecasting. (In some countries, like the UK, the fiscal council (OBR) is all about independent forecasting, while in others, like Sweden, forecasting was already reasonably independent before the council was formed.) This is a case of better late than never. Some EU countries have recently established fiscal councils through their own initiative as a response to the debt crisis (such as Ireland, Portugal and Slovakia), so this EU initiative is playing catch-up in their case. The bad news is that the rest of the EU’s response to the debt crisis makes life difficult for these new fiscal councils, and may in effect hinder the formation of new ones. In essence this is because the broad thrust of the EU’s crisis management has been to take away national autonomy in making fiscal decisions. I complained about this in the context of the new treaty here. What I had not fully appreciated until recently is that you now almost need a fiscal council just to try and work out what the huge number of sometimes conflicting EU directives actually mean in terms of what a country is allowed and not allowed to do. I think some economists view this development as benign, because they see it as part of an inevitable transition to a fiscal union. When others point out that so far it is no such thing, it is suggested that a fiscal union has to be done in stages for (largely German) political reasons, and that large scale European transfers will emerge once national fiscal responsibility is nailed down. Even if this was the planned pathway, I have severe doubts that it is a feasible path politically. I have even greater doubts that the new European regime will be able to deliver fiscal responsibility. As I have often argued, simple rules that produce severely suboptimal outcomes are not sustainable. (For a recent discussion of this sub-optimality, see Karl Whelan.) This was true with the original SGP, and it is just as true now. The idea that you can have effective legally binding rules based on something as difficult to measure as a structural budget deficit is bizarre. As Tyler Cowen suggests, a far better path would be one built on mutual trust. How can Germany begin to trust fiscal policymaking in other countries? Not, I would suggest, by placing monitors inside those countries – this is control, not trust. I far better way starts with recognition that it is in each country’s own interest to maintain fiscal discipline. The original Stability and Growth Pact was based on seeing fiscal policy as a free rider problem, where market discipline had been removed. We now know that this was a misreading, perhaps encouraged by a similar misreading by markets themselves. The pain caused by current austerity will linger long in the national memory. Once we recognise that debt responsibility is in the national interest, the aim should be to encourage the creation of national institutions that support that interest – national fiscal councils. These institutions can then be seen by other countries as their allies in maintaining fiscal discipline at the European level. I fear the major barrier preventing this happening may be the European Commission itself. I remember attending a Commission conference soon after the Euro was formed, where I presented a paper that, among other things, explored the possibility of new institutions involved in national fiscal policy. I had a discussion with a senior Commission official, who thought this was an excellent idea - because the Commission could be that institution! Like any bureaucracy, the Commission is all about super-national control, and not subsidiarity. One recent episode is a case in point. The Commission has recently suggested withholding funds from Hungary because it believes that country has not taken sufficient action to control its deficit. Yet only a little over a year ago Hungary had a newly created and highly effective fiscal council under George Kopits. It was abolished by the Hungarian government largely because it was doing its job (for more information on this, see my earlier post). Where was the Commission then? I’ve been away for a few days at the OECD, so have only just picked up Scott Sumner, fully endorsed by Tyler Cowen, asking why there are not more people advocating a higher inflation target, or a nominal GDP target, in the UK. (Being away did not in theory prevent me blogging, but I’m afraid in practice I prefer exploring Paris!) I think this is a good question. While there is a very active UK debate about fiscal austerity, most discussion on the monetary side tends to be within the parameters of current policy. Those familiar with the case for raising the inflation target can skip the next couple of paragraphs. For those who are not, the idea is that the central bank/government could moderate the impact of the zero lower bound constraint on interest rates by announcing that it would allow inflation to go above 2% for a significant period after the recession was over. This would help stimulate the economy today through various channels. One is that expected lower future short interest rates should reduce long term interest rates today, which would in turn stimulate borrowing by firms and consumers. Another is that, according to the New Keynesian Phillips curve, expected inflation today depends on expected inflation tomorrow, so if the central bank allowed above 2% inflation in the future, this would raise actual and expected inflation today, lowering real short term interest rates today. One of the interesting things about this policy proposal is that it is very New Keynesian rather than Old Keynesian. This policy was first suggested as a way out of Japan’s lost decade (when nominal rates were also stuck at the zero bound) by Paul Krugman, and subsequently formalised by Eggertsson and Woodford (Gauti B. Eggertsson & Michael Woodford, 2003. "Optimal Monetary Policy in a Liquidity Trap," NBER Working Papers 9968) among others. This paper suggests that the optimal policy can be approximated by replacing an inflation target with a price level target, because a price level target implies a period of excess inflation would automatically follow a period of insufficient inflation. Scott Sumner in particular has championed nominal GDP targeting, which would have similar effects, and this policy has gained a lot of support in the US and elsewhere. So why relatively little debate on this issue in the UK? At the political level, simple politics combined with recent experience may be important. Price inflation has been, and still is, high in the UK, and this is highly unpopular because it has been associated with large falls in real wages. An argument by any political party that the Bank should target higher inflation, rather than be admonished for its inability to prevent it, would be a hard sell. Nominal GDP (NGDP) targeting may be much more palatable to a non-macro audience, as Krugman points out. However a problem here for the government may be the accusation that such a change reflects a failure of their austerity programme, for reasons discussed below. Whether this issue might be on the Labour Party’s agenda I have no idea, although I cannot see any reason in principle why it should not be. What is perhaps more puzzling is a lack of discussion by the Bank itself. As far as I am aware, the Bank has not discussed these various alternatives to its current 2% mandate. I am also not aware of any members of the current MPC discussing them in public. Of course any decision to change the mandate would not be for the Bank or MPC to make – it’s a decision for the Chancellor - but that does not rule out discussion of options. I think this lack of ‘official’ discussion may also discourage debate elsewhere. (I know I thought of writing something myself on this a few weeks back, looked for something from the Bank as a ‘hook’ to argue with, and on finding nothing let it slide.) In contrast to the US, macroeconomic blogs in the UK are not developed or influential enough to initiate a debate themselves. The lack of public analysis from the Bank, or MPC members, could perhaps be another example of ‘groupthink’ that Laurence Ball suggests in his analysis of Bernanke’s views on the zero lower bound. My first experience of this came at a conference organised by the Centre for Central Banking Studies in 2009. Chris Sims and Mike Woodford were the other guest speakers, and both my and Mike’s paper provoked discussion of this policy issue. I have often been in meetings where an option may be politely discussed, but you just know it has no chance of serious consideration, and this seemed like one of those. To be honest, I think this represents central bank conservatism more than anything else. One of the main arguments against this policy option is time inconsistency. Even if a promise to raise future inflation was effective today, when the recession ended and it was time to implement the policy, the temptation would be to renege on this commitment and return to the 2% inflation target. A smart private sector would realise this, so the promise to raise future inflation would not be believed, and so it would not be effective. A price level or NGDP target is partly designed to help overcome this problem. However, in the case of the UK, where a change in policy would almost certainly have to be decided by the Chancellor rather than the Bank, this should be seen as less of a problem for the Bank or MPC. Its credibility would not be on the line, and the government rather than the Bank would come under pressure to renege. Exactly the same could be said of another objection to raising the inflation target, which is that it might be perceived as a way of helping the government reduce the ratio of debt to GDP. This charge could be a more serious concern for the Chancellor, if it was perceived that his austerity program was not delivering the fiscal target he had set himself. However, it should be less of a concern for the Bank, because they have always deferred to the Chancellor’s authority to set the inflation target. So for both reasons, I suspect the lack of discussion by the Bank and MPC may reflect a taboo about deliberately raising inflation above 2%. I should add that I think the advocates of NGDP targets sometimes go too far in suggesting that this is an obviously preferable way to speed economic recovery compared to fiscal stimulus. Promises to raise future inflation are costly, which is why there is a time inconsistency problem. However the current recession is, in my view, much more costly, so it needs both monetary and fiscal action to help bring it to a speedy end. Furthermore, the current recession may well indicate an endemic problem with low inflation targets, which is that we are in danger of hitting the zero bound quite frequently. (With this in mind, can anyone explain to me why the Bank of Japan has just announced an inflation target of only 1%?) This seems like an excellent time to be discussing alternatives to inflation targeting. So it is a pity that this policy option is not being debated more actively in the UK right now, with help from the Bank and MPC members. In the absence of a discussion based around the Bank, then this seems to be exactly the kind of issue that the Treasury Select Committee of the House of Commons should investigate. The committee has always taken a keen interest in all aspects of monetary policy, and such an investigation would be a good follow-up to their recent report on Bank accountability. The Balanced Budget Expansion Debate Begins? Less than a week ago, I wrote in a post on my blog: “So there is something we can do with fiscal policy, without increasing government debt. Why does hardly anyone talk about this?” Two days ago Ian Mulheirn from the Social Market Foundation published a detailed proposal exactly along these lines. (There is also a short piece in Monday’s Financial Times.) A coincidence of course, but very welcome. This proposal involves bringing forward by four years £15 billion of tax increases pencilled in for after 2015, and using that money for temporary infrastructure spending in those four years. This is a specific example of a more general idea, that you can stimulate demand through additional but temporary increases in government spending financed by temporary increases in taxes. The proposition that this will stimulate aggregate demand is a pretty robust bit of macroeconomic theory. In fact we can go further, and say that the benchmark multiplier for such a policy will be at least one. This suggests that this proposal, by using OBR figures, may be rather conservative in its estimate of the impact on UK growth. The multiplier will be one if consumers are of the simple Keynesian type who consume some constant fraction of their current income. Higher taxes will reduce their income, but as long as their propensity to consume is less than one, there is a net positive effect on demand, which gets translated into higher output and higher income. But higher income leads to higher consumption, and we get the famous ‘balanced budget multiplier’ of one which every first year undergraduate learns how to prove. However, as Professor Michael Woodford has recently shown, we get exactly the same multiplier of one if consumers are much more sophisticated, and look at their entire lifetime income when planning their consumption. The basic intuition here is that any temporary tax increase gets smoothed over their lifetime, so the impact on current consumption is small. As the simple Keynesian case shows, any short term impact there is will be offset by higher incomes generated by higher government spending. This all assumes an unchanged level of real interest rates. Higher aggregate demand should lead to some increase in expected inflation. If the Bank of England keeps nominal interest rates unchanged (which, with inflation falling, they should), then real interest rates will fall, which will provide an additional stimulus to demand. That is why the benchmark multiplier will be at least one. If the government spending is in the form of useful infrastructure projects, this has the additional bonus of increasing future supply. Why have tax financed temporary increases in public investment not been part of the austerity versus stimulus debate so far? For those who oppose austerity, I think the problem is a (correct) belief that debt financed increases in spending would be even more effective at stimulating demand (because ‘Ricardian Equivalence’ does not hold), and that the short term dangers of increasing debt are vastly overblown. While I think this line is right in principle, I fear this debate is unwinnable so long as the Eurozone crisis continues, and the media obsesses about ratings agencies. We can argue till the cows come home that the Eurozone is different, because these countries do not have their own central bank, and that the market takes no notice of ratings agencies, but these arguments are drowned out by the daily news about Greece and other Eurozone economies. On the other side, among those who favour austerity, I think there is a reluctance to consider policies that increase the size of the state, even though this would only be for a few years. There is also the obvious unpopularity of tax increases. However there is now a real danger that by the time of the next election UK unemployment may still be rising and the recovery will be modest. It is going to be very hard to win an election with this record. (I do not think Argentina will distract attention again as it did in 1982!) The great advantage of tax financed increases in spending is that they stimulate the economy without going back on the austerity pledge. Indeed, because they stimulate growth, they reduce headline budget deficit figures and so increase the likelihood that austerity will be successful in bringing down the ratio of debt to GDP. So these proposals from the Social Market Foundation are very welcome indeed. They show that something can be done to stimulate the economy without increasing debt. Of course there is a great deal of discussion still to be had on what taxes to increase, and what investment to fund. However from a macroeconomic point of view most combinations will succeed in stimulating the economy. With unemployment continuing to rise, there is still time to act. It is imperative that we do. I have argued that the decision to reduce the UK budget deficit more rapidly in 2010 was a major policy error. (I looked at figures on cyclically corrected budget deficits in the UK, US and Eurozone here.) One argument against this view is that without such a tightening, the UK would have been at greater risk of a loss of confidence in UK government debt. I think many believed that at the time, because they thought what was happening in the Eurozone could happen to the UK. As interest rates on government debt continue to fall around the world, this fear looks increasingly groundless. As the IMF has recently noted, growth as well as debt levels are important influences on market perceptions. A rather better argument (see the first comment on this post) is that if fiscal policy had not tightened in 2010, the Monetary Policy Committee (MPC) of the Bank of England would have raised interest rates in 2011. In the Spring of that year, 3 of the 9 members voted for an interest rate rise from the zero bound floor level of 0.5%. If the economy had been stronger because of less austerity, would two or more committee members have switched sides, leading to an increase in UK interest rates? A think it is far from clear that they would. Inflation was high in part because of the result of those austerity measures. VAT was increased from 17.5% to 20% at the beginning of 2011, which probably added around 1% to inflation in 2011. You could argue that as this was always going to be a temporary influence, it was neither here nor there as far as MPC decisions were concerned. I think this would be a little naive. One of the major concerns of MPC members around that time was the loss of reputation that the MPC might suffer if inflation got too high, and here I think the actual numbers mattered. But supposing the Bank had raised rates. Would that have been the right thing to do? In hindsight clearly not. The ECB did raise rates at this time, and that now looks like a very foolish decision, but it looked pretty foolish at the time. (See this from Rebecca Wilder.) I also argued strongly against raising UK interest rates in early 2011. My note was called ‘Ten reasons not to raise interest rates’, but the main argument was very simple. The costs of inflation exceeding its target were much lower than the costs of a persistently high output gap. At the time it was possible to try and calculate these costs based on what the Bank itself was thinking, because it published output and inflation numbers under two alternative scenarios: one where interest rates were kept flat and another where they increased through the year (based on market expectations at the time). Here is the table I put together. Numbers are estimated using the Bank of England’s February 2011 Inflation report. Output gap numbers assume a 4% gap in 2011 (consistent with the latest OECD Economic Outlook), and that potential grows by 2% p.a. 2013 numbers are guesses based on extrapolating the Q1 forecast. Raising rates through 2011 had virtually no impact on 2011 numbers, so these are ignored. Higher interest rates leave inflation is a little lower in 2012, and inflation then comes back to target in 2013. In contrast, keeping rates flat would leave inflation half a percent above target in 2013. Raising rates would reduce output growth by a quarter of a percent in 2012 and by half a percent in 2013, leaving the output gap 0.7% higher in 2013. Now suppose we take the difference between the forecast number and the target for inflation each year, square this figure and sum. We do the same for the output gap. That gives a very crude measure of the social loss implied by each policy, and this is shown in the column headed loss. Take the difference between the two policies in the final column. Raising rates clearly does better on inflation, but worse on the output gap. However the output gap losses are much larger, because inflation is near its target, but the output gap is not. This puts into numbers a very simple idea, which is that missing the inflation target by half a percent is no big deal, but raising the output gap by over half a percent when it is already high is much more costly. Now we can argue forever about the size of the output gap, but we need to remember that in these calculations it is mainly a proxy for the costs of higher unemployment, and we have real data on unemployment. We can put the same point another way. Although 5% inflation in 2011 sounded bad, it was the result of a temporary cost push shock, caused by higher VAT and energy prices. Inflation was bound to come down again, because unemployment was high. (I think some in the Bank began to doubt this basic macroeconomic truth because they kept on underestimating inflation.) There was never any sign of higher price inflation leading to higher wage inflation. In contrast, the recovery from the recession was slow, so this was the problem to focus on. Crucial in this analysis is the view embodied in the Bank’s forecast that it takes some time before higher interest rates influence output and inflation. What this means is that to prevent inflation rising in 2011, we really needed higher interest rates at the end of 2009. A year in which GDP fell by 5%! Those who argue that the MPC ‘failed’ because inflation reached 5% in 2011 are really arguing that the MPC should have made the recession deeper. So, if the MPC had raised interest rates in 2011, they would have been wrong to do so. That is obviously true in hindsight, but it was also true based on the more optimistic projections made at the time. It would also have been true even if the economy had been stronger because of less austerity. One final point on this policy error. It is just possible that, without the Eurozone crisis, the LibDems might not have been persuaded to adopt the Conservatives’ fiscal plans as part of the coalition agreement. But the real source of the error is to be found much earlier, when the Conservatives opposed the government’s fiscal stimulus measures in 2008/9. From that point on, their macroeconomic policy was all about austerity, and they denied that this would have harmful effects on the economy. I’m afraid I have no knowledge about why they decided to adopt this line, but it has proved to be a very costly mistake. Policy errors like 2010 austerity – what can academics do? In this post I claimed that 2010 should be counted as one of the major errors of UK macroeconomic policy. In fact the claim is much more general, because 2010 was the year that the consensus among policymakers in the OECD area shifted from enacting stimulus to pursuing austerity, with damaging consequences in many countries. A number of comments and a couple of blogs added to my speculation on why this error might have occurred. Here I want to consider more generally what role academics and economists can play in preventing policy errors, and why this may depend on the reasons for those errors. Before coming to that, let me address one common objection to my view that 2010 was a major policy error at the time, and not just in hindsight. The objection is that the slowdown in 2011 was due to factors other than austerity that could not have been foreseen. There are two problems with this argument. First, the projected speed of recovery even before these adverse shocks occurred was pitifully slow. What the IMF described in late 2010 as ‘solid UK growth’ was actually 2.5% per annum into the medium term, which on their own admission only gradually closed the output gap. The OBR’s June 2010 post-budget forecast also had GDP growth of 1.2% in 2010, 2.3% in 2011, and never above 3% thereafter. Considering GDP was estimated to have fallen by 5% in 2009, this was a tepid recovery. The second, and more important, flaw in this argument is that it ignores the fact that good policy should allow for risks. As I elaborated here, because of the zero bound for interest rates there was no insurance policy if bad shocks did occur (as they did). In contrast, if positive shocks had led to a recovery that was too rapid, monetary policy could have been used to cool it down. To put it more simply, austerity was a huge and unnecessary gamble, and the gamble did not pay off. Much the same could be said for many other countries. One class of explanation for this kind of policy error focuses on hidden agendas. The most obvious in the case of austerity is a desire to reduce the size of the state, as Chris Dillow suggested. As Mark Thoma put it: “The notion of "expansionary austerity" was the cover, but so long as government shrinks as a result of the policy, the expansionary part is secondary.” Chris has recently suggested even darker motives. I put forward another, more mundane, explanation that is specific to the UK: get the cuts out of the way well before an election, and hope the electorate have short memories. Perhaps an explanation specific to the US might be that it suited those opposed to the President that the economy failed. If this type of explanation is correct, is there anything that can be done to prevent or expose this kind of subterfuge? In this post, I was rather pessimistic. I suggested that it required near unanimity amongst academics before the media would begin to question the cover stories. Without unanimity, the cover story would just be described as controversial. Even with academic unanimity, there is the possibility that moneyed interests could manufacture controversy through think tanks, as has happened with aspects of climate change debate. [Update 20/2/12 - on this see George Monbiot.] Of course the debate is still worth having, but it is unlikely to change things very much or very quickly. This pessimism may be a little overdone, however, in the case of austerity. Politicians, above all, want to be re-elected. For that reason the cover story view does require a belief that the harmful impact of (early) austerity will not last long enough for it to matter at the next election. If that is not the case, academics might be able to convince politicians that it may not be in their own interests to undertake the policy. Which brings me to another class of explanation, which is policymakers fooling themselves. The hidden agenda may still be there, but the difference is that politicians convince themselves that the cover story is also true. In the case of austerity, there are a number of stories politicians can tell themselves. They can believe in expansionary austerity, of course. They could believe that Quantitative Easing will be enough, although I would hope any central banker would tell them that they had no idea what impact QE might have. They might have believed that the recovery was well under way, so any damage done by austerity would not be noticeable. Does this case also require near unanimity amongst academics to convince the policymaker they are fooling themselves? There are at least two reasons to suggest it might. First, (macro)economics is not held in the same regard as other sciences, for good reason. I would not go quite as far as one comment which said scientists proclaim facts while economists give out opinions – I think we are somewhere in between these two, but still. Second, the two way link between ideologies and economics makes it too easy for the politician to dismiss views they do not like by believing they are politically motivated, and it also makes it too easy for the politician to find academics who will tell them the stories they would like to hear. A third class of explanation for policy mistakes is that they are genuine mistakes. Events may arise which come as a surprise to most academics as well as policymakers, so there is genuine uncertainty. In terms of 2010, I think the probability of Greek default with possible Eurozone contagion was important at changing attitudes among those who might otherwise have been sympathetic to more fiscal stimulus/less austerity. In the case of the UK, it may have been crucial in persuading Nick Clegg and the LibDems to support greater austerity as part of the coalition. As I wrote here: “What finance minister can sleep easy when there is a chance that they too might be forced down the road being travelled by Greece, Ireland, Spain, Portugal and Italy?” Now I go on to argue, following Paul De Grauwe, that this crisis was a crisis of the Eurozone, and not the precursor to a generalised government debt panic. Although that view is gaining increasing acceptance as interest rates on government debt elsewhere continue to fall, at the time this proposition was neither obvious (governments with their own currencies default through inflation and depreciation, and lenders will fear that) nor widely argued. In situations of this type, academics can in principle have much more influence. Furthermore, the blogosphere allows for an immediacy that might just be able to influence opinions before mistakes are made, and positions become entrenched. In the case of 2010 and austerity, I do not think it would have been enough. The political forces pushing for austerity, the hidden agendas, were too strong, and the panic induced by events in the Eurozone too great. But academics should never become so pessimistic about their potential influence that they give up trying. Chris Dillow has a nice follow-up to my earlier blog on balanced budget fiscal expansion. I first read the Kalecki paper when I was at Cambridge, but for better or worse this is not part of the macro lectures I give at Oxford. We all miss Andrew Glyn a lot. Is this what I had in mind when I said that if the government argued against all the possible balanced budget spending and tax measures that might stimulate the economy, we might suspect other motives? Before trying to answer that, I should say that part of my complaint was that such policy ideas are not part of the public debate, so we do not know what the government’s response would be. (We could infer, from the fact that none of these policies are being pursued, that they would be against them). I should also note that the FT suggests that the Liberal Democrats are thinking about tax switches, although I have my doubts about whether raising the £10K tax threshold would be particularly effective at stimulating demand. When I drew parallels in an earlier post between the current UK situation and 1981, I mentioned by way of anecdote a little speech I made at the internal meeting of Treasury economists at the time. What I did not report was that at that meeting I made exactly the argument Kalecki puts forward. (Needless to say Kalecki was not normally quoted in discussions about budgets in the Treasury! - I was young, and probably knew I was going to leave fairly soon.) I think what Kalecki says made a good deal of sense in that particular context: as we were to find out, part of the Thatcher agenda was to take on the power of organised labour. Whether it makes sense in the current context I’m less sure. Some of the factors identified by Chris in a later post could simply be attempts to deflect sympathy for the unemployed (which in turn would translate into criticism of the government) rather than the more strategic design he suggests. What I probably had more in mind on this occasion were two things. The first involves the point about ideology which I have mentioned several times. If your ideological perspective is that ‘government is always the problem’ and that the private sector is best left alone, then blaming all our ills on the excesses of the previous government (rather than the financial system), and pursuing austerity by government as the means of correcting those ills fits well with that perspective. To use government intervention as a way of correcting a problem with the private sector (insufficient demand) does not. The second is that nearly all the fiscal proposals I suggest involve redistributing money from the rich to the poor. This makes macroeconomic sense, because the poor are more likely to be credit constrained than the rich. 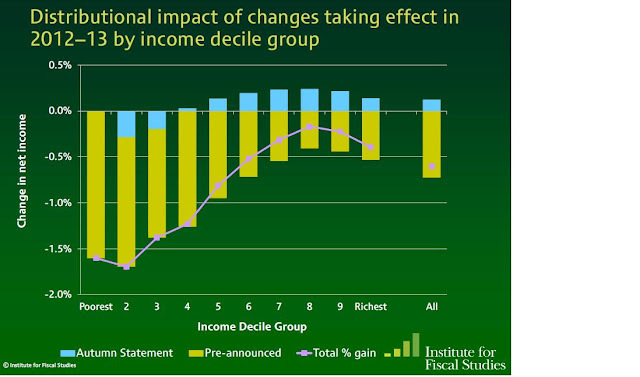 It would also make sense from an equity point of view: the poor are suffering most as the result of austerity, as the chart below from the IFS illustrates. Unfortunately it does not make political sense for the current government. There is also a familiar but important point here about political influence and recognition. Issues to do with debt and financial markets are reported daily and major players in this area have almost guaranteed access to politicians – from whatever party. They tend to be rich, and will complain about being taxed at 50%. The young unemployed, who now make up nearly a quarter of the 16-24 age group, have by comparison very little political voice. Even when they are talked about when monthly figures are released, we are likely to get stories about motivation and how to brush up your CV, rather than recognition that with many times more people looking for a job than there are vacancies no amount of self help will make the problem go away. (See this by Zoe Williams.) These are the political reasons why the ‘counsels of despair’ that Jonathan Portes rightly complained about are able to endure. Or why is no one talking about balanced budget expansion? As UK unemployment continues to rise, Jonathan Portes asks why the government seems to accept this as inevitable. The same question could be asked in many other countries. The answer is invariably that nothing can be done by way of fiscal stimulus because debt and deficits are so high. Jonathan argues (rightly in my view) that concerns about debt in the short term are hugely exaggerated. I’ve suggested this is particularly true when we have Quantitative Easing. We seem to be in a strange prisoners dilemma where it is absolutely clear that the world wants more safe assets (the rate of interest on indexed debt is zero if not negative), but every individual government thinks that if it provides them lenders will suddenly panic, and think they are no longer safe. I think this fear is irrational, but unfortunately events in the Eurozone feed this fear on a daily basis. (It should not, because governments without their own central banks are in a different position from those that have, but that is a rational argument.) Taking notice of ratings agencies is also irrational (see Jonathan again), but it adds to the fear. So even though I think it is fairly easy to win the intellectual debate on debt, this may not be what is decisive. The news is better still if interest rates are stuck at the zero lower bound. Higher demand and output will imply some increase in inflation, and any increase in expected inflation will reduce real interest rates, further stimulating activity. The size of the multiplier will be above one. So there is something we can do with fiscal policy, without increasing government debt. Why does hardly anyone talk about this? (One exception is Robert Schiller.) I suspect the problem is as follows. Those favouring stimulus think debt is not a constraint, and know that there are many reasons why a fiscal expansion financed by issuing more debt will be even more expansionary that one financed through taxes. So why argue for second best? But why do those who do think debt is a constraint not welcome this alternative possibility of raising demand? The reason is obvious: a tax financed fiscal expansion requires taxes to rise. The problem is not an economic one. The distortionary effects of temporarily higher taxes are likely to be small relative to the resources wasted and permanent damage caused by high unemployment. (See Chris Dillow as well as Jonathan Portes on this.) The problem is political, particularly for countries with right of centre governments. However, just because something may be politically difficult should not stop the argument being made. Once we get on to this territory, then there is further ground to explore. As well as tax financed government spending, we could think about tax and transfer switches that would stimulate demand. The marginal propensity to consume out of a benefit increase is likely to be quite high, whereas that out of reducing the tax relief on pension contributions for high earners would be pretty small. (Remember any tax switch need only be temporary.) Redistributing money from the old to the credit constrained young would also be likely to raise demand: raise child benefit by increasing death duties, for example. Some companies are not that short of cash at the moment: how about tax incentives to encourage them to invest today rather than tomorrow. The idea that there is no alternative to doing nothing about rising unemployment could not be further from the truth. If governments find objections to all these ideas, one might begin to suspect that there are other motives at work. I used to be more comfortable about using the standard labour market model, coupled with the variant involving imperfectly competitive goods and labour markets, to analyse the impact of immigration. The idea that immigration was initially unpopular because it led either to lower real wages for the indigenous workforce, or an increase in the amount of involuntary unemployment generated by imperfect competition, seemed to accord with popular perceptions (although see here (10/2/2012) for a discussion of the origin of such perceptions). And I was always careful to add that any decline in real wages would disappear in the long run, as it would be eliminated by increased investment. However work in the UK has suggested that in this case the simple model may be seriously misleading once again. What about wages? The MAC study’s summary of empirical work on the impact of immigration on wages concludes “The majority of studies estimate that migrants had little impact on average wages, differing in their assessments of whether migrants raised or lowered average wages.” There seems to be a common finding that immigration lowers wages a little at the bottom of the income distribution, but raises them at the top. This is hardly consistent with the simple textbook labour market model. Perhaps we can content ourselves that the textbook model might still be reliable for much larger changes in migration or minimum wages, but that for more modest changes factors like heterogeneity due to skill shortages or monopsony can account for the empirical evidence cited above. However, even if I did have time to make these qualifications to the basic model in my lectures, would students remember them, or just remember the predictions of the model? What have Keynesians learnt since Keynes? That is the question asked by RobertWaldman (9th Feb) in a comment on my post, and also in a dialog with Mark Thoma. I’ll not attempt a full answer – that would be much too long – and Mark makes a number of the important points. Instead let me just talk about one episode that convinced me that one part of New Keynesian analysis, the intertemporal consumer with rational expectations, was much more useful than the ‘Old Keynesian’ counterpart that I learnt as an undergraduate. In the mid 1980s I was working at NIESR (National Institute for Economic and Social Research) in London, doing research and forecasting. UK forecasting models at the time had consumption equations which included current and lagged income, wealth and interest rates on the right hand side, using the theoretical ideas of Friedman mediated through the econometrics of DHSY (Davidson, J.E.H., D.F. Hendry, F. Srba, and J.S. Yeo (1978). Econometric modelling of the aggregate time-series relationship between consumers' expenditure and income in the United Kingdom.Economic Journal, 88, 661-692.) While the permanent income hypothesis appealed to intertemporal ideas, as implemented by DHSY and others using lags on income to proxy permanent income I think it can be described as ‘Old Keynesian’. As the decade progressed, UK consumers started borrowing and spending much more than any of these equations suggested. Model based forecasts repeatedly underestimated consumption over this period. Three main explanations emerged of what might be going wrong. In my view, to think about any of them properly requires an intertemporal model of consumption. 1) House prices. The consumption boom coincided with a housing boom. Were consumers spending more because they felt wealthier, or was some third factor causing both booms? There was much macro econometric work at the time trying to sort this out, but with little success. Yet thinking about an intertemporal consumer leads one to question why consumers in aggregate would spend more when house prices rise. (I don’t recall anyone suggesting it changed output supply, but then the UK is not St. Louis.) Subsequent work (Attanasio, O and Weber, G (1994) “The UK Consumption Boom of the Late 1980s” Economic Journal Vol. 104, pp. 1269-1302) suggested that increased borrowing was not concentrated among home owners, casting doubt on this explanation. 2) Credit constraints. In the 1980s the degree of competition among banks and mortgage providers in the UK increased substantially, as building societies became banks and banks starting providing mortgages. This led to a large relaxation of credit constraints. While such constraints represent a departure from the simple intertemporal model, I find it hard to think about how shifts in credit conditions like this would influence consumption without having the unconstrained case in mind. 3) There was also much talk at the time of the ‘Thatcher miracle’, whereby supply side changes (like reducing union power) had led to a permanent increase in the UK’s growth rate. If that perception had been common among consumers, an increase in borrowing today to enjoy these future gains would have been the natural response given an intertemporal perspective. Furthermore, as long as the perception of higher growth continued, increased consumption would be quite persistent. Which of the second two explanations is more applicable in this case remains controversial -see ‘Is the UK Balance of Payments Sustainable?’ John Muellbauer and Anthony Murphy (with discussion by Mervyn King and Marco Pagano) Economic Policy Vol. 5, No. 11 (Oct., 1990), pp. 347-395 for example. However, I would suggest that neither can be analysed properly without the intertemporal consumer. Why is this a lesson for Keynesian analysis? Well in the late 1980s the boom led to rising UK inflation, and a subsequent crash. Underestimating consumption was not the only reason for this increase in inflation – Nigel Lawson wanted to cut taxes and peg to the DM – but it probably helped. So this episode convinced me that it was vital to model consumption along intertemporal lines. This was a central part of the UK econometric model COMPACT that I built with Julia Darby and Jon Ireland after leaving NIESR in 1990. (The model allowed for variable credit constraint effects on consumption.) The model was New Keynesian in other respects: it was solved assuming rational expectations, and it incorporated nominal price and wage rigidities. As I hope this discussion shows, I do not believe the standard intertemporal consumption model on its own is adequate for many issues. Besides credit constraints, I think the absence of precautionary savings is a big omission. However I do think it is the right starting point for thinking about more complex situations, and a better starting point than more traditional approaches. One fascinating fact is that Keynes himself was instrumental in encouraging Frank Ramsey to write "A Mathematical Theory of Saving" in 1928, which is often considered as the first outline of the intertemporal model. Keynes described the article as "one of the most remarkable contributions to mathematical economics ever made, both in respect of the intrinsic importance and difficulty of its subject, the power and elegance of the technical methods employed, and the clear purity of illumination with which the writer's mind is felt by the reader to play about its subject. " (Keynes, 1933, "Frank Plumpton Ramsey" in Essays in Biography, New York, NY.) I would love to know whether Keynes ever considered this as an alternative to his more basic consumption model of the General Theory, and if he did, on what grounds he rejected it. Charles Goodhart writes (FT-£) that “Proposals that central bankers report their expectations of official rates, beyond some short future horizon, are retrograde, pushed forward by fashionable theory without reference to empirical reality.” By short horizon here I think he means three or six months: much shorter than the recent move by the US Fed. Charles is usually right about most things, and similar comments have also been made by other experienced ex-central bankers, so I think it is important to set out carefully one important counter argument. Charles writes that “whether the publication of central bank predictions of the future path of interest rates is likely to be beneficial depends on the relative accuracy of such forecasts.” I disagree. I’m happy to assume they are no better than those of forecasters in general. What is then gained by publication? The key point is that central banks, or members of a central bank committee, have inside knowledge. Not about how the economy works, or of statistics a few days before they are published, but about themselves. Their forecasts for interest rates tell us what they are likely to do if events (inflation, growth etc) turn out as they expect, and if they are being consistent. So the important question is whether this information is useful. Central to the academic case for delegation of interest rate decisions to central banks is that they are less susceptible to the temptations of time inconsistency. (Those familiar with what this means can skip this and the next paragraph.) A classic example involves the trade-off between inflation and output. Suppose the monetary authority wants zero inflation, but would like output above the level consistent with zero inflation (the ‘natural’ level of output). Suppose the public share those preferences. The monetary authority announces a policy of achieving zero inflation, and people form expectations on that basis. Once those expectations have been set, the monetary authority realises that outcomes would be better if output was higher than the natural rate. This will raise inflation above zero, but given their and the public’s views on output, everyone would be better off with a little bit more inflation and higher output. This is sometimes called reneging or cheating by the policy maker, but notice that everyone is apparently better off when it changes its mind. Now, if people are smart, they will know the monetary authority will behave this way, so they will not believe the initial announcement of zero inflation. In fact the only situation in which expectations prove correct is when they are so high that it is no longer in the monetary authority’s interest to renege. So the outcome is high inflation with no gain in output. In this situation it would be much better if the monetary authority could commit to zero inflation and not renege on this commitment. It is generally thought that central banks are more likely to be able to do this than politicians, in part because politicians will be too tempted by short term gains, and will discount the longer term repercussions. Being an independent central bank may increase your ability to commit to a policy in the face of the time inconsistency temptation, but it does not guarantee that result. Central bankers would like to be able to establish their credibility for commitment. (I gave a particular example when it might matter a lot here.) Publishing interest rate forecasts allows them to do this. If events turn out roughly as expected, yet the central bank does not follow its own forecast for interest rates, it might be because they are exploiting these time inconsistency possibilities. Following your own forecasts when nothing changes does not prove that you are resisting such temptations, but it is consistent with doing so. Now Charles Goodhart might respond, in the spirit of his article, by saying that events never turn out roughly as expected, and so interest rate forecasts can never be used in this way. However the critical question is as follows. Is the fog of news so dense that we can never say anything useful using these forecasts? I think not. For a start, we not only have the bank’s interest rate forecasts, but also the inflation forecasts that go with them. We often have no problem saying that the balance of news about the economy over some period is – say – that activity is stronger than expected, and so inflation is expected to be higher. If, despite this, the central bank reduced interest rates compared to their own forecasts, we would be suspicious that they were being inconsistent. However, if we do not know what they were expecting to do with interest rates (because these forecasts were not published), then we are no wiser about whether they are being consistent or not. Charles talks about the importance of putting error bands around forecasts in general (the fan charts), and I could not agree more. However in this particular case, we do not need such bands. To the first approximation, we only need to know what their best guess was for future interest rates, and the associated best guesses for inflation and other variables. This is because we are using the interest rate forecast to judge consistency, and not as a forecast per se. Now perhaps the importance of time inconsistency problems in monetary policy is not as great as implied by the academic literature. However, I think the chances of the public being misled by the publication of interest rate forecasts is so small that on this occasion it is worth taking this academic idea seriously. I believe that in ten years time, when more central banks publish interest rate forecasts in this way, we will wonder what all the fuss was about.